"It won’t win an Oscar, but it’s damned good entertainment. He's back!" The Columbia Review. Arnold Schwarzenegger’s screen presence has not diminished since his early days in The Running Man, Total Recall, and the Terminator movies. Yes, he has aged, but every man would wish to age like that. Moreover, in Sabotage he shows a certain Clint Eastwood quality, combining a crusty veteran law enforcer who’s seen it all, the physical capabilities of a much younger man, and the capacity for violent outbursts of a teenager. In other words, with Sabotage, Schwarzenegger fulfills his famous promise — “I’ll be back!” — and he does it with a vengeance. Sabotage is an action movie, and as such, it delivers. There is a great deal of violence, including shooting, hacking, punching, bombing, and more shooting, all topped off with bloody body parts galore. The dialogue, if you can call it that, is driven by incessant foul language, not only the classic four letter word, which is used on average twice in every sentence by most characters, but multiple variations of cussing bravado on steroids to the point of becoming borderline comical. 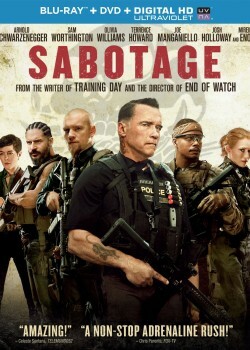 But Sabotage is not about witty dialogue, original character study, or clever plot. In fact, the plot here is a mere vehicle on which all the violence is loaded up and delivered with excellent cinematography and the latest special effects. Sabotage is the latest of many action movies whose story is driven by the unbearable grieving of someone who lost beloved family members to evil, violent men. The lead character is understandably pushed to irrational and extreme actions by unbearable grief, thirst for revenge, and desire for a violent payoff. In Sabotage, the evil guys are drug cartels, the dead family is the wife and son of the commander of a DEA team, and the extreme action he takes has the good guys commit a cardinal sin that results in betrayal, loss, and deaths—many, many deaths. This is not an original storyline, but Sabotage does it well, with good acting and believable, if exaggerated, tough-guy camaraderie. What perhaps distinguishes Sabotage more than anything is the absolute dedication to realistic images of human violence and depravity. While we have grown accustomed to squirting blood and hacked body parts in horror movies (and the occasional shocking scenes in mysteries and thrillers) Sabotage takes bloodletting explicitness to uncommon levels of butcher-shop clarity and detail. Perhaps it’s an attempt to compliment Quentin Tarantino by imitation, but Sabotage lacks the redeeming emotional depth of Django Unchained, the cocky charm of Inglorious Brothers, or the visual artistry of Kill Bill. Not that Sabotage is flat. Schwarzenegger is surprisingly capable and convincing both in his grief and in his care for his team, in addition to delivering great action scenes with aplomb. His character’s moral choices are deeply flawed, and he is believable in that role. In fact, while Sabotage type-cast him in a role similar to his older muscle movies, Schwarzenegger shows an uncanny ability to perform a range of emotions that could be a hint of things to come–in a trajectory similar to Clint Eastwood. Supporting Schwarzenegger here are very capable actors, including (on his team of agents) Sam Worthington, Terrence Howard and Mireille Enos. But it is Olivia Williams who dominates the screen with a superb performance as a homicide detective who is torn between growing affection and rising suspicion, a classic heart v. mind conflict, which she delivers with subtlety and skill that foretell star roles to come. In summary, despite its basic flaw of overdone crudeness and bloodiness, Sabotage delivers excellent action, consistent suspense and a familiar yet nuanced plotline, all spiced up with good acting and intense realism. It won’t win an Oscar, but it’s damned good entertainment.